Ready to be the coolest gift giver this season? Give meaningful and fun gifts that contribute to your favorite paddler’s health, wellbeing and passion for paddling. Read on for my top picks for paddlers who do (or would like to) take on their wellness with as much stoke as they take on the water! Bring 1 cup water to a boil. Add 1tbs loose leaf Pumpkin Pie Chai. Immediately add 1 cup almond milk. Bring to a boil. Watch the almond milk to ensure that it doesn’t spill over. As soon as the mixture boils remove from heat, cover and let steep for 5 – 10 minutes. Strain and enjoy! Add honey or maple syrup for sweetness if needed. Anti-inflammatory, adaptogenic, sweet, delicious and calming. Enjoy mixed in with warm milk of choice. Great right before bed to help your favorite paddler get restful sleep so that they’re energized to get on the water. One of my favorite, healthy winter treats. 1 Cup Milk of choice (cow, almond, coconut or soy). Combine Golden Milk with milk in a saucepan. Heat until barely boiling – this is important as you don’t want to boil. Stir every so often to mix well. When mixture is nice and warm remove from heat and pour into your favorite mug. Enjoy! Buy Here – and it’s on Holiday sale right now! Tap into amazing, experienced teachers from the comfort of your own home. Streaming and downloadable yoga classes make it easy for you to train your body for paddling longevity while increasing focus and calm. If you’d prefer yoga that is specific to paddlers you can also check out my downloadable yoga classes on my Vimeo channel starting at $5! Learn too cook delicious seasonal meals that have the power to enhance boost your health and heal your gut. There are over 100 recipes in this book and also an introduction to Ayurveda, the 5000 year old sister-science to yoga. My clients, both paddling and Ayurveda, hear me talk about the importance of daily routine all the time! If we really want to cultivate health, vitality and longevity we need to make effective choices everyday. A daily routine that works with our circadian rhythm as well as our unique constitution is MORE important than the food we eat and how much we exercise. Truly. This book really will change your life and take your health to a new level. Give the gift of paddling health and longevity. Over 30 postures that specifically target paddling muscles and alignment + great information for putting together an effective home practice. 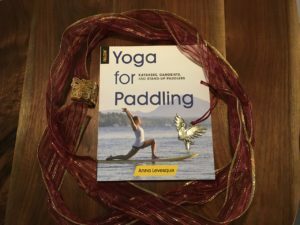 Buy from mindbodypaddle.com for a signed copy! Every paddler needs a food thermos to be able to enjoy warm, nourishing meals on the go. Winter season is the time when eating warm meals is important for optimal health and digestion. Your favorite paddler can now have a warm meal waiting at the end of the run/workout. Help them paddle all winter long! Staying warm is an important part of staying healthy during the fall, winter and spring paddling season. A lot of heat is lost through the head and this NRS skullcap is seriously the warmest and lowed profile I’ve ever used! Help your buddies stay warm with this affordable and thoughtful gift. Makes a great stocking stuffer! My go-to for sore paddling muscles! Use this balm to promote circulation and warm the muscles and tendons. Feels great after a warm shower before bed so that muscle soreness doesn’t keep you from sleeping well. Staying with the theme of keeping your favorite paddlers warm this season, we go to my favorite wool socks – Smartwool! The PhD ski or snowboard socks can be used under a drysuit or as a cozy after paddling layer (or both if you do it right!). This is my new favorite design – love the owl! Made by a paddler for paddlers (and anyone else who loves fleece skirts, shorts and/or tutus)! Kelly is a Grand Canyon and Salmon River guide who designs and sews these fun, warm and stylish skirts. Perfect for river trips, after paddling or paired with tights to wear around town. Buy on FunhogginFleecewear Esty site! Aromatherapy has a long history of health and wellness benefits. Each individual oil has specific health benefits, for example, lavender promotes relaxation and restful sleep. Lemon essential oil is refreshing, uplifting and energetic, eucalyptus promotes healthy breathing, clearing of the nasal passages and is also anti-bacterial. Some companies create unique blends that are fun and easy to use. doTERRA essential oils are my favorite and two blends I love are Peace and Motivate. Use Peace when you want you want to promote peace and calm. Motivate is an uplifting blend that I use, especially when I’m doing office work 🙂 They come as roll-ons which makes them really easy to use and keep in your bag. Also, I always have a bottle of On Guard sanitizing mist in my first aid kit, my car and my camping kit. It’s much nicer than your run of the mill antibacterial gel. You can also find other essential oil brands at your nearest health food store. doTerra has a specific sign up process to buy wholesale online. You can learn more below to order under my account if you choose. Don’t hesitate to email with any questions. Bigger Items for Your Favorite Health-Conscious Paddler! Give the gift of energy that lasts all day, great looking skin, optimal digestion, a peaceful mind and deep, refreshing sleep. Most people know me as a ww kayak/ SUP/yoga coach and instructor trainer, but I’m also a wellness coach. Help your favorite paddler get a jump start on their health and wellness for 2019 with an Ayurveda Wellness Coaching session or package. Or perhaps you want to introduce them to greater wellness and self-care in a retreat setting. In that case you may want to register them in the Art of Self Care Retreat coming up in March 2019.
Who doesn’t want the gift of greater power and confidence? Paddling instruction is an empowering experience that will last a lifetime. Following your passion and doing what makes you feel joyful helps to reduce stress which leads to greater wellbeing. Contribute to your favorite paddler’s health by giving them an experience that reduces stress and brings them a lot of joy! Mindbodypaddle.com (you’re here!) for women specific and holistic approach to paddling including whitewater kayaking, Creek Week, SUP, SUP yoga. I offer private and custom group instruction. Make paddling easy and fun with the gift of an inflatable SUP (stand up paddleboard). They travel pretty much anywhere, including regular checked baggage on a plane. They’re light, durable and easy to store. Perfect for the beginner and for the experienced paddler who wants to travel or has limited storage. My favorite inflatable board right now is the BIC SUP Performer Air 10’6 inflatable. I just flew to China with it to teach SUP yoga and it was awesome. I’ve also surfed it at the beach and paddled it on the French Broad River. It’s super versatile and a great gift! Perhaps the perfect gift to get a loved one started on the path to getting outside and active! This playful river runner is sure to add joy under the tree for your BFF whitewater kayaker! It’s got speed through rapids, loves to get recklessly vertical and also rolls easily. There’s nothing quite like front surfing the Axiom on a smooth, glassy wave on your favorite big water run to crush stress and fuel stoke! It comes in four sizes, including a kid’s size, so there’s a perfect fit for everyone on your list 🙂 And they come in cool color combos too. I like to think of my paddle as my most important piece of gear. It’s my motor and everyone should have the best motor to power them! If anything is likely to increase the risk of injury from paddling it’s a heavy, low quality paddle. Think about it, all that repetitive motion already wreaks havoc on our shoulders, why do it with a cumbersome paddle? Giving the gift of a paddle upgrade is a really thoughtful and health conscious gift for longevity of your friend’s and family’s shoulders. SUP is the Werner Trance. I love the foam core blade! WW Kayaking is the Werner Stikine. Carbon is key for shoulder health! SUP Yoga is the Werner Zen. Great quality, looks great and affordable. This is a seriously generous gift of health and wellbeing. The opportunity to unplug from the daily stressors of life for a week to focus on paddling is transformational. The gift you’re giving includes increased confidence, skills development, relaxation, rejuvenation and access to the present moment. Paddling camps, retreats and trips offer experiences of a lifetime that your favorite paddler will never forget. Have more gift ideas for the health-conscious paddler? I want to hear them! Please share in the comments below! Happy Holidays! !